Each one of us has our own concept on how to create a website or design one. However, it is also good to set some standards in order for a website to work well and perform its expected task. 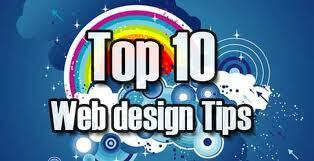 Here are web design tips for you to think about while you create your own website. If you are running an ecommerce website, it is very much likely that new clients will read some personal testimonies coming from your old clients. If they read something positive, they will most likely check you out better as you have gained their trust and attention. Photos also help as it makes your website more personal and human-made. Ads along the sidebar is fine as a lot of people are already used to them, however, adding pop up as a medium for advertisements is a major turn off. This will slow down your page load and will drive 90%-95% of your traffic away. You just don’t add a red font color to a dark green background, not unless you are designing a Christmas card. There are already a lot of softwares to use to be able to come up with a good set of color scheme in designing a website, so use one. While an online support icon says you can always leave them a message to be able to reach you, some people would like to contact you via your business email, business phone and mobile, and maybe via fax. Also, it will help if you create a contact form with captcha to ensure that every lead should be taken good care of. Let your customers feel that you want to keep in touch with them. #6 Do not use blinking and running images and texts. Animated images and texts especially those that are running or blinking and too colorful are not only difficult to read but are extremely annoying so never use them. Put more importance on the content, avoid typography mistakes and make sure that the images are clear. ther by categorizing them. You do not want your users to get lost in your website paradise. #4 Improve your website page download speed. You might want to get yourself a dedicated or semi-dedicated server for this for you to increase your bandwidth for your business and allow some more download speed to your website. There is a survey that says an online shopper using a broadband speed only waits to up to 4 seconds for a page to load. If you do not meet this expectation from the online shoppers, chances are, your competitors will end up receiving your customers with pleasure. If you would like to brag about your graphic designing skills, well, it is not supposed to be done in your website as you create your own website. Why? Because whenever you create a whole new design from one page to another, that will leave your customers confused as to where they are. Sign Up, Free Trial, and Download graphics and links are samples of the elements in a site that calls for an action. These icons and graphics together with the links should be placed within a websites’ strategic places, like the top right position or along the sidebar. If you have a good budget, you should hire a professional web designer in order to work out the web designing for you. Make a good first impression to your customers by making sure that you create a website that is engaging to eyes with useful links and content. It should load fast and should come with handy dandy information.